Release of the Yamaha 4-stroke Motocrosser "YZ250F 50th Anniversary Special Edition" - News Releases | Yamaha Motor Co., Ltd.
Release of the Yamaha 4-stroke Motocrosser "YZ250F 50th Anniversary Special Edition"
On September 20, 2005, Yamaha Motor Co., Ltd. will release a limited edition of 100 units of a "YZ250F 50th Anniversary Special Edition" model of the highly competitive "YZ250F" motocrosser that mounts a liquid-cooled 4-stroke DOHC single-cylinder 5-valve compact engine on an aluminum semi-double cradle frame. This commemorative special edition celebrates the 50th anniversary of the founding of Yamaha Motor. The coloring of this "YZ250F 50th Anniversary Special Edition" is based on the image colors of Yamaha International Corporation (Y.I.C. 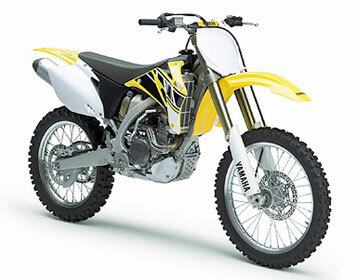 ), the forerunner of Yamaha Motor Corporation USA founded in 1977. This popular color scheme and graphics have long been symbolic of the racing history that has always been an important part of Yamaha culture throughout its 50 years. That is why this coloring and graphics have been chosen to grace our latest motocrosser in this commemorative model as a symbol of our unchanging corporate philosophy. The items unique to this limited edition model are the "Inter-coloring" elements of (1) yellow body coloring, (2) white & black strobe pattern special graphics, (3) special handlebar pads, (4) a black seat and (5) a commemorative emblem, etc. These give this model an image of the Yamaha machines that competed in AMA Supercross and Nationals motocross, AMA road racing, the World GP road racing during the latter half of the 1970s. "YZ250F 50th Anniversary Special Edition"